The copper coupon is a pretty simple test. A given amount of solder is reflowed onto a copper coupon with a specified amount of each flux. 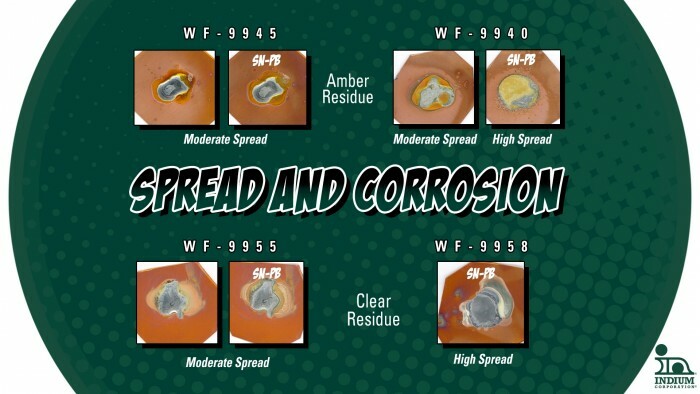 The test can be performed on either lead-free solder or tin-lead solder. When comparing one flux against another, it is important that not only the same solder alloy be used, but also the same test conditions; obviously the bigger the bead of the solder, the better wetting. Better wetting produces assemblies with fewer shorts and opens, greater hole-fill (lower voiding), and a reduction in icicles. This test also shows the difference between the residue left by the rosin-containing fluxes and the fluxes without rosin. In the chart, the top two fluxes are rosin-based and have an amber-looking residue. The bottom fluxes are rosin-free and have a clear, waxy looking residue. To complete this test, each of the reflowed samples was aged for 10 days (240 hours) to observe if there was any corrosion. If there was, you would see where the flux had started to attack the copper and discolor it. 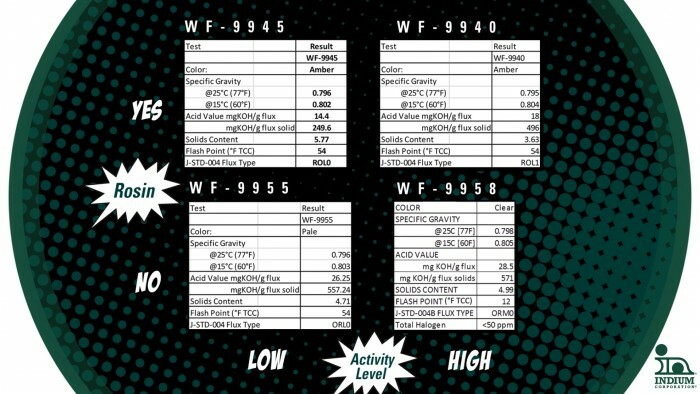 We can see from this test that none of these fluxes showed any corrosion after reflow.